The line of men waiting to pray last Friday night after chapel was long. I lead a team from our church that travels down to the Union Gospel Mission once a month on 4th Friday to minister to the 300 or so men at the shelter. Some of them are staying there, participating in the discipleship program. Others are there for the night, while some are bussed in for the evening from other shelters, to have a meal and hear a message. While a group of volunteers and staff are feeding the men physically, our job is to feed them spiritually. Our job is to meet them where they are, much like Jesus did when he sat down next to the Samaritan woman. We worship with them, we share a biblical grounded message with them, and we pray with them, corporately multiple times throughout the service and one-on-one at the close of service. This past Friday I had the opportunity to experience powerful prayer time with several of the men. I prayed with one man who wasn’t sure that he could trust God. I prayed with another man who was in dire need of physical healing from a disease that may lead to his death. I found myself dumbfounded and nearly speechless as I prayed with a man who confessed to me that he had contemplated suicide and that our being there that night saved his life because he heard us speak of a God who loves him and values him. He understood that even though he was homeless and his life had been turned upside down, he still mattered and God had not forgotten nor forsaken him. I prayed with a young man, full of joy, who prayed Psalm 23–the Lord is my shepherd–in my ear as I prayed for him. These are just a few samplings of the prayers expressed Friday night. It is a glimpse of the prayers we hear each time we go. It is through these prayers, God affirms that He is in control and He is indeed at work in this world. Lately, I’ve seen and heard a lot of discourse about acting “apart from prayer” or “instead of prayer.” There are even people who are convinced prayer is a waste of time because it doesn’t work. And I guess if you’re not a believer, that should be the response I expect. I think that prayer, like faith, should often be accompanied by additional action. But prayer isn’t like an ATM machine either. In fact, it’s more of a conversation between me and the God of the universe. Perhaps you find my belief in God, let alone a powerful, personal God alive and at work in the universe, a fool-hardy endeavor. That’s certainly your right. You don’t have to believe what I believe. You don’t have to agree with what I think. But for me, it’s too hard not to believe that there is a God. I’ve simply seen Him at work too often. I’ve experienced answers to prayers too many times. I’ve witnessed God at work in my life and in the life of others. I’ve found myself in far too many God moments to discount that He exists. Yes, prayer alone may not end gun violence. But that’s not my prayer. I’m praying for God to transform minds and change hearts. To reduce incidents of gun violence, including mass-shootings, drive-by violence, and domestic disputes, certainly requires we act. I don’t believe locking up everyone’s guns is the answer. I know it’s not. People have been killing each other far longer than we’ve had guns. I grew up when gun laws weren’t as strict as they are today, yet it seemed like we had less gun violence. I agree, something’s changed. I think we value our own life more and we value the lives of others less. We are more transactional than we are relational. The only god we worship tends to be the one we see in the mirror. Personally, I don’t think the effort to decrease the permanence of faith in the various aspects of our lives is unrelated to the outcome that faces us today. As imperfect people, we don’t always express our faith perfectly in our daily walk. Yet, faith values life. All life. The born. The unborn. The living and the dead. The here and now and the eternal hereafter. Do we need to figure out how to keep weapons out of the hands of madmen? Absolutely. Do we need to improve our outreach to those who find themselves on the fringes of society? Probably. I’m not sure they want to be reached. But that doesn’t mean we shouldn’t try. Do we need to recognize that our self-identity shouldn’t rest on the opinions of others or measured by our level of celebrity? Damn Skippy. As a believer my identity rests in Christ. I am who he says I am. Redeemed. Forgiven. Free. Servant. Minister. Warrior. Prayer is an essential part of my life. It serves as a reminder that I have much to be grateful for and it helps me get out of my own narcissistic perspective and train my thoughts on the concerns of others. It helps me work through my own stuff too. Which is good, because I’m a hot mess most days. When I’m praying, I am doing something. Just ask the people I pray with, pray for, and pray over. Like love, prayer is a verb. It is one of the most powerful actions I can take. I have personally witnessed prayer change lives, circumvent courses of direction, and alter outcomes. I’ve witnessed the healing power of prayer as well as experienced the comforting solace prayer brings. That doesn’t mean that there isn’t a physical component that needs to accompany our prayers, just like love is often accompanied by a smile, a hug, or a kiss. Believe it or not, prayer works. I appreciate this post. Let me tell you why. First, I appreciate that you go to the Union Gospel Mission to do more than shout and spit, but listen and pray. So much of my formative years were filled with a type of ministry that would encourage young preachers to “cut their teeth” on missions like this, and the “preaching” was usually not effective, much less encouraging. I don’t remember the hell-fire-damnation types taking the time to put an arm around some homeless guy and listen to his story and pray with him. No, all I heard was 15 verses of “Just As I Am.” I have no problem with hard preaching, but I have a big problem with a lack of compassion and grace. Secondly, I’ve had a REALLY bad day, and part of it showed in something I said to my wife. In a moment of self-doubt, I said, “I’ve been praying for you for years, and what good has that done; you’ve not been healed, yet.” Yeah, there’s a lot of bad theology in that statement, but that’s how I felt at the moment. 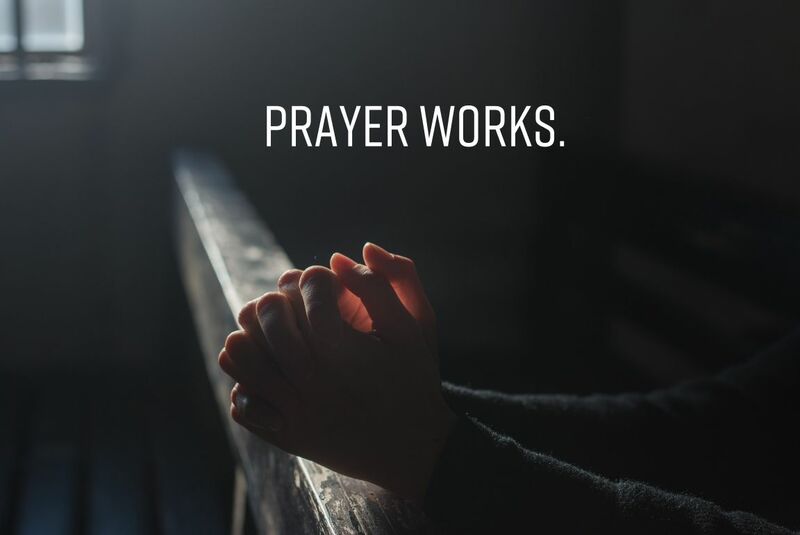 So, reading your post was a good reminder of what I already know: Prayer isn’t always about the request or the answer, but the Person to whom we are praying. Why hasn’t my wife been healed? Only God knows. But is it because my prayers are ineffective? Not necessarily. But it’s not so much about her healing, or any other request on my heart, that necessitates my prayer – it’s obedience. I don’t know how God is going to work some things out. I have been asking people to join with me at our church as I have gone nearly every night to pray. Out of hundreds invited, at most only four or five have shown up – the whole month. Is it disappointing? Most certainly. But did God tell me to pray? Yes. That’s why I’m doing it. He will accomplish His work, whatever that is, but I’m going to trust Him, keep praying, and give Him the glory for whatever happens. Will my wife be healed? Maybe not. Will our little church grow in numbers? Maybe not. But God is still God, and for some inconceivable reason, He desires time with me. So, I will pray. Thanks again. God bless, my brother. Thanks for this Anthony. My heart breaks for the challenging road you and your bride find yourselves on. No doubt it hurts. No doubt it’s hard. If my words helped you find solace amidst the storm in any way, then I’m humbled and honored. It’s been said God works in mysterious ways. I hesitated to post this because I wasn’t sure the piece was ready. A quiet, still voice encouraged me to publish it. I’m glad I did. Blessings to you and the love of your life. Know that you are not alone, even if that prayer room seems a little empty. People are praying with you and for you.